Invasive species are considered one of the most pressing threats to wildlife. Displaced to a new habitat, often as a result of human actions, these species spread aggressively in their new home, competing with native species for resources and altering the ecosystem. However, the situation for native species might not be as hopeless as thought, at least when it comes to competition between closely related species, as a small lizard native to the US has shown. About 15 cm in length, Anolis carolinensis, also called green anole, can typically be found across the southeastern region of the country, an area that has recently been invaded by the Cuban brown anole, Anolis sagrei. One effect of this invasion has been competition over habitat and food between the two. 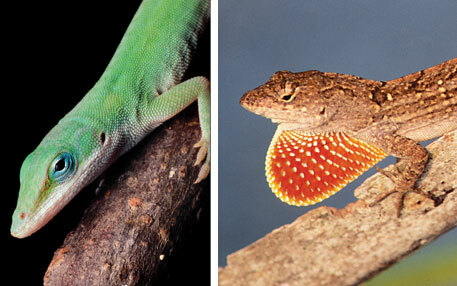 Both species live on tree perches, and the invasion of brown anoles has forced green anoles, which normally occupy space from ground to tree crown, to shift to higher perches. The lizard seems to be at a disadvantage here, as the higher perches are smooth and narrow, and harder to grip than the lower branches. However, a study by researchers led by Yoel E Stuart from the University of Texas at Austin, US, shows that the lizards can evolve to adapt to their new habitat in a matter of years. The study was published on October 24 in Science. The experiment was conducted on spoil-dredge islands in Mosquito Lagoon, Florida, US. Dredge islands are human-made structures, created from dredge during the digging of a waterway in the 1950s. These islands have varying degrees of vegetation and have been naturally colonised by A carolinensis. The team introduced Asagrei specimen to three of six such islands in May 1995. It was predicted that the competition presented by the invading species would force green anoles to move to higher perches, which proved to be true. In August 1995, three months after brown anoles were introduced, an increase in the perching height of green anoleswas observed. On uninvaded islands, or ones that had not been colonised by brown anoles, no such change was seen. A second prediction said that the move would drive the evolution of the toepads and lamellae of the lizard to better adapt it to higher branches. Lamellae cover the bottom of the toepads, helping them gain traction. A greater number of lamellae and a larger toepad would help the lizards in manoeuvring at higher branches. In 2010, researchers studied the toepads and lamellae of brown anoles and found the prediction to be true. The lizards were found to possess larger toepads and more lamellae on islands where the two species were in competition for tree space than the ones where the brown anole was absent. Most surprisingly, this change took only 20 generations of lizards to occur, a time period of about 15 years between the introduction of the invasive species to the islands and this study. Before arriving at conclusions, the team had to be sure that the evolution had actually occurred due to the presence of a closely related invasive species, and not due to some other process. To test this, they set up a garden experiment where eggs from both invaded and uninvaded islands were collected, and the hatchlings raised in identical environments. The fact that the characteristics of these lizards remained as they would have been on their respective islands suggested that the changes were, indeed, genetic. Other factors that could have caused the changes in the lizards, such as a response to environmental changes or the ability of the brown anole to only colonise islands inhabited by big-toed lizards, were also systematically discounted. Evolution as a result of interaction between two closely related species is termed “character displacement”. Simply put, it is an evolution in the traits or characteristics of these species to reduce competition between them, as has been observed in this study. Well-documented cases of character displacement are rare, even though the phenomenon is considered to be widespread (see ‘Evolving to survive’). FINCH | Species of finches on the Galapagos Islands have developed different beaks. Finches that eat small fruits have narrower beaks. INDIAN MONGOOSE | The small Indian mongoose has smaller canines and eats smaller prey when it coexists with larger mongoose species who eat larger prey. GIANT RHINOCEROS BEETLE | Two species of the Giant Rhinoceros Beetle from south east Asia are identical in size except in areas where they occur together. Martin Whiting, associate professor at the Macquarie University, Sydney, who heads his own lizard lab where he studies their behaviour, ecology and evolution, explains the importance of the study: “Character displacement, a common term in ecological literature, has not previously been tested in real time. The authors use an old work-horse, the Cuban brown anole, to test if its introduction in south-east US will elicit evolutionary change from the sole resident, the green anole.” Whiting was not part of this study.